Are you ready to bring a new pet home? While it is a noble idea to want to take a pet under your care, many first-time pet owners might overlook that they are making a big commitment. Here is some advice to help you fully anticipate and prepare for your journey as a first-time pet parent. Ask yourself why you want a pet. Is it for companionship, for your kids, or simply because you know it's compassionate to take in a needy animal? Whatever your reason, research intensively about the various needs and care requirements for different kinds of pets and breeds. For instance, dogs require a lot of human attention in comparison to ferrets, hamsters and rabbits. If your primary purpose of getting a pet is for companionship, consider a cat or a dog. Anticipate the costs involved in taking care of a pet, including pet supplies, veterinarian services, making home adjustments, pet deposits and professional pet sitter services. Also, consider the amount of space you have in your home and yard, and whether you or a family member has allergies. Safety-proof your home and buy all the necessary pet supplies. Must-have pet supplies vary depending on the kind and age of your pet. For instance, if you are bringing home a dog, you will need items such as leashes, collars, feeding and water bowls, bedding, identification tags, dog food and a pet first-aid kit. On the other hand, parrots require a cage, feeding bowls, a source of entertainment and food. You'll also want to stock up on supplies to keep your pet-friendly home clean. A vacuum cleaner is a must no matter what type of pet you get. Be sure to opt for one that works well on carpet and has a HEPA filtration system A second necessity are non-toxic cleaners to wipe up wet messes. If you're getting a caged pet that's likely to cause lingering odors in your home, it's also wise to invest in an air purifier; scented sprays can help in a pinch, but they'll only cover up rather than remove smells, and may irritate family members with allergies and even your new pet. Similarly, safety-proofing adjustments on your house will depend on the type of pet you bring home. For dogs and cats, install locks on cabinets, keep products that can be hazardous, such as cleaning supplies, out of reach. Cover electrical wires and cords with chew-proof cable protectors, and mount rails and bars on windows to prevent them from jumping over. Install fences and gates to keep your pet away from dangerous areas of your home, such as pools, hot tubs, ponds, and gardens, as well as around the yard to prevent her from escaping. Mesh wire fences work well at containing both big animals, such as dogs, and smaller pets, such as rabbits, ferrets, hamsters and cats. Before bringing home an older pet, it is essential that you spend some time with the shelter or rescue agency you're adopting from to learn more about what the pet likes and dislikes, whether it has any health issues, and its routine. As much as possible, stick with the already-established routine for the first few weeks, and only change it gradually. Slowly introduce your pet to your family members, new vet and the neighborhood. If you have a busy work schedule, consider hiring a professional pet sitter to offer companionship and take care of the pet when you are away the first few weeks after your pet comes home. Dogs require regular exercise, so it's best to hire a dog walker to take Fido for walks. Spending quality time with your new pet regularly helps her to get accustomed to you and trust you. Arrange for some activities to do together, such as playing and taking walks together. Bath times and feeding times can be an opportunity for you to bond with your pet. A rescued adult pet may be more nervous and fearful at first than a puppy or kitten. Talk to her in a calm tone to help her feel comfortable with you and her new environment. 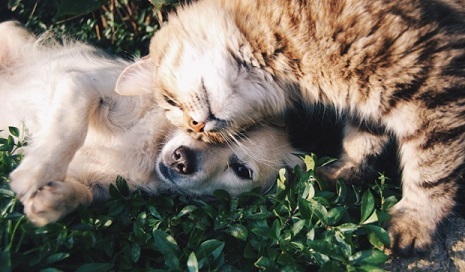 When you are irritable and anxious, it can pass on to your pet, while an easy demeanor relaxes and helps her connect with you. Getting a pet can enhance your life or be nerve-wracking, depending on how well you are prepared for the journey. Proper planning will help you have a positive and lasting experience with your new companion. Jessica Brody is a dog lover and creator of OurBestFriends.pet. She created the site to offer a place for animal lovers to share their favorite pet photos and stories about their furry pals. Jessica believes dogs are the best creatures on earth. She enjoys writing about and sharing photos of dogs and other pets on her website.